The torsion rod front suspension in the Jowett Javelin has the torsion rods arranged longitudinally, one on each side of the car. The rods have octagonal ends that are a press fit into female octagonal bores in the front spring arms, and chassis frame mounted anchors to the rear. The torsion rods are pressed into the front end of the spring arm trunnion bushing. At the rear of the torsion rods there is a ground clearance adjustment facility. The adjustment is made by a long-thread bolt that is threaded into a trunnion that fits into an arm pressed onto the rear of the torsion rod. The long-thread jack bolt features a machined spigot that locates into a chassis frame mounted pad. The torsion rods are not the only suspension medium, the front spring arm trunnion bushes are of the Metalastik type, with the inner sleeve a press fit onto the spring arm trunnion bushing. The outer sleeve is a press fit into the front bracket housing, and at the rear, it is clamped into the chassis mounted bracket. The torsion bar passes through the spring arm trunnion bushing. The torsion rod can be removed with the minimum of dismantling using a special puller. This puller is made up from 1 5/8" 8 SWG tube 3 3/8" long. The tube has one side cut longitudinally to provide clearance for the chassis frame. A substantial 'D' shaped end cap with a 7/16" clearance hole in the centre of the diameter is welded on to the tube. The distance between the flat edge of the 'D' and the edge of the hole must be 5/16" to provide clearance at the chassis frame. A 7/16" BSF all thread rod is threaded into the end of the torsion rod. A jam nut can be used to lock the rod. A nut and plain washer are used to draw the torsion rod out of the front spring arm and the rear adjustment lever. Park the car on a firm level surface and apply the hand brake. Jack up the front of the car until the wheels are clear of the ground. Place chassis frame on suitable stands. Remove the battery and disconnect the midship bearing support from the frameside, on the side from which the torsion rod is to be removed. Slack-off the torsion rod adjustment completely and remove the rear locating plate. Place the torsion rod puller in position against the bracket on the frameside at the rear end of the torsion rod and insert the all-thread rod into the tapping at the rear end of the rod. Draw the rod clear of the octagons in the normal manner. Remove the torsion rod to the rear, driving the front end octagon through the adjusting lever. When refitting set the spring arm against the rebound rubber, and the adjusting lever against the frameside, smear the octagonal ends with graphite oil (Loctite Antisieze or Penrite Copper-Eze) and drive the torsion rod ends into position. Make sure that the torsion rod is refitted in the same orientation as it came out. Take special care to guide the front end into position, and to make absolutely certain that the rod suffers no surface damage. The rod should of course be fitted with the tapped end at the rear. Note: If the torsion rod puller is not readily available the rod can be removed by driving out to the front, after removing the front apron, disconnecting the front engine mountings and jacking the engine slightly so that the cylinder blocks are clear of the torsion rod line. The rod can also be refitted from the front with the engine in this position. It is important to understand that it is very likely that the torsion rods have been in situ for more than fifty years. If the vehicle has been standing for long periods in damp conditions, the rod ends may be frozen in their mating components. In severe cases, twenty tonnes or more may be required to shift the torsion rod. It must be appreciated that, while considering the above condition, attention is drawn to the section on Handling and Storage of Torsion Rods. To remove a front spring arm, slack-off all of the torsion rod adjustment. Place a jack under the outer end of the spring arm and raise the arm so that the rebound buffer rubber can be removed. Lower the spring arm until it is completely relaxed. Remove the spring arm pin (special bolt) and the distance tube securing the lower end of the swivel pin (king pin) and stub axle assembly. Remove the bolt securing the lower end of the shock absorber. Support these suspension components away and above the spring arm. Take care not to damage the brake hoses. Slack-off the clamp bolt at the rear of the spring arm trunnion, and detach the bracket from the frameside at the front end of the trunnion. Draw the torsion rod clear of the spring arm as described in Removing and Refitting the Front Torsion Rods. Draw the spring arm forward, clear of the rear clamp, and lift out. 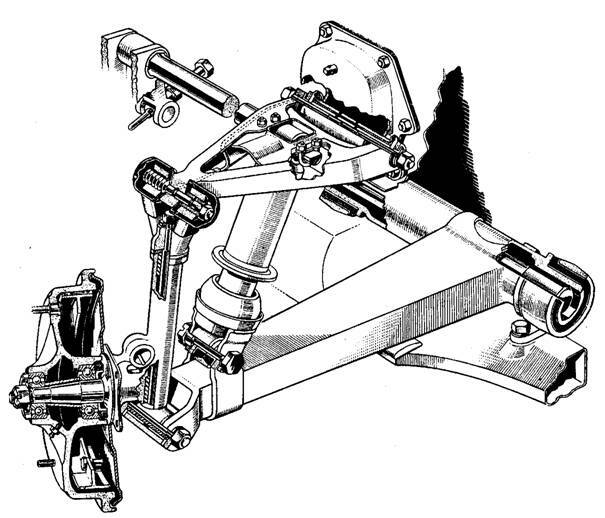 Alternatively, if the engine has already been removed from the chassis, the torsion rod and spring arm can be removed together, by detaching the spring arm as described above, removing the rod locking plate, driving the torsion rod clear of the rear end octagon, and drawing the rod and spring arm forward until clear of the chassis. Check the outer end of the spring arm for excessive wear on the swivel pin and shock absorber drillings, and for any possible distortion. It should be noted that wear will occur only if these bolts have ever been loose. Check the Metalastik trunnion bushes for wear or oil damage and, if necessary, drive the front spring arm bracket and bush assembly from the front end of the trunnion, and press out the worn bush. Press the replacement bush into the bracket, and press the bracket assembly on to the spring arm trunnion so that the face of the larger of the two arms on the bracket is at approximately 80° to the line of the spring arm. Note: The diagram below shows angle in the approximate static load condition, indicating the increased angle of 84°, due to vehicle's weight being carried. Drive or chisel off the bush at the rear of the trunnion and press on the replacement, with the flanged end to the front. The spring arm trunnion bushes should be replaced in pairs on the spring arm. Prior to commencing re-assembly, the chassis frame should be carefully examined for cracking in the spring arm mounting areas. Should welding be required, then the torsion rods should be removed completely and kept well away from the welding process. 1. The swivel pin and distance tube must be settled correctly in the outer end of the spring arm, so that the suspension movement is free. 2. The swivel pin bolt should be installed with its head facing the rear. It should be tightened down so that maximum steering lock is achieved when the back plate bolt head contacts it. 3. Shock absorber bushes and thimbles should be examined for wear and replaced if necessary. 4. Prior to adjusting the torsion rod, jack up the spring arm and replace the rebound buffer. 5. Set the chassis ground clearance. 6. Re-tighten the hardware after 500 miles have been covered. On later type front suspension, the above instructions generally apply. Rubber bushes are fitted at the base of the swivel pin. The following method should be adopted for setting the chassis height (ground clearance), by adjusting the torsion rod tension. Stand the car on level floor, and measure the distance from the underside of each frameside to the floor. The measurements should be taken at the front of the gearbox cross member. Set the tyre pressures to 26 psi (180 kPa). Jack up the car, using a trolley jack under the centre of the gearbox cross member, until the wheels are just clear of the ground. It is important that a wooden protection pad should be placed on the jack pad, to protect the frame member. Slack-off the location plates at the rear end of the torsion rods, and slack back the lock nuts on the adjuster. Lubricate the adjuster long-thread bolt, its spigot, the pad in its trunnion, the adjuster arm in its bracket and the threaded trunnion in the arm. If these components are not free to move and are not lubricated, there will be excessive strain imposed upon then while the adjustment is made. Such loadings can cause wear at the long-thread bolt spigot. Reset the adjuster as necessary, in relation to the measurements previously taken, to obtain a ground clearance of 9¾" – 10" (248 – 254 mm) at each end of the gearbox cross member. Lower the car to the ground and bounce on its suspension and check the measurements again. Jack up and make the final adjustments if necessary. Re-tighten the torsion rod end plates and tighten the adjuster bolt lock nut. In isolated cases it may be found that the specified dimension for ground clearance cannot be obtained due to excessive wear on the adjusting bolt spigot or thread. This is normally caused by adjusting with the weight of the car on the road wheels, and it will be necessary to either build up the spigot or replace the bolt. It should be noted that no wear takes place once the adjusting bolt is in position. The torsion rods were manufactured to very close tolerances, the octagons were milled and the shank length was very finely finish ground. Because of this, great care must be taken when handling torsion rods. Jowett Cars Limited requested that torsion rods be stored on felt lined racks, with indentations to ensure that the rods could not come into contact with each other during storage. When handling the rods, make sure that they are not struck in any way likely to cause damage to the surface. A very slight and small scratch can weaken a torsion rod and exceptional care should be taken when handling. Should surface damage occur, the torsion rod should be replaced at the earliest opportunity. All of the foregoing seems a bit incongruous when it is considered that, installed in the car, the torsion rods are exposed to stones thrown up by the road wheels and to rust due to water thrown up at them. To date the writer is not aware of a torsion rod actually breaking due to road or rust inflicted damage. However, it is very well known that if a minute weld spatter lands on a torsion rod, the rod will soon break at that point. The same applies should there be an inadvertent nick ground in by a wayward angle grinder disc. The Jowett Car Club of Australia does not have many second hand torsion rods in stock. Therefore, great care has to be taken with those that remain. If storing second hand torsion rods, it is a good idea to label each one with details of where on the car it was located. The Jowett torsion rod is a very long life component, and if treated with the care and respect it deserves, will last for many years. FRONT SPRING ARM HARDWARE – WARNING! Many Javelins have been lost to scrap because of rust problems in the front floor area. This is quite a complex concern because it involves the front spring arm mounting hardware. The frame sections where the front spring arms bolt on can, if the securing hardware is neglected, crack and permit water to enter the complex hollow section. Once the water has entered, it runs rearward down to the front floor/bulkhead area where it is trapped and causes corrosion. There is a long bolt which goes through the spring arm bracket and frame vertically. This bolt can be found to be loose, being in a not easily seen position and, each time the front suspension moves violently the shock is transferred, to the bolt and then down the frame where it quickly breaks the rust weakened frame. Once broken, there is very little that can be done. Because of the complex construction at this point, it is extremely difficult to repair. The importance of keeping this key bolt tight cannot be overstressed enough. The vertical spring arm bolt passes through the sheet metal of the box section of the frame member. There is a distance tube welded into the structure, which takes the clamping load when the bolt and nut are tightened down. Re-tighten the front spring arm hardware after 500 miles have been travelled since hardware installation. Note: The Jowett Car Club of Australia does hold limited stock of chassis extension arms and the jigs for welding them into the car.